Network Rail, the people that own and operate Britain’s rail infrastructure (after someone sold it by mistake) say that 37 million people pass through London’s Charing Cross Station every year. That’s equivalent to the population of Uganda. It’s probably not the same 37 million people passing through every year, though I daresay one or two risk doing it several times, out of sheer devilment. But in any event a lot of them will also pass by this monument outside the station entrance, which commemorates a 700-year old love story. When Eleanor of Castile, beloved queen of Edward I, died near Lincoln in 1290, the tough but distraught King of England ordered that a memorial should be built at every point where his wife’s body was rested on its long journey south for burial in London. Twelve memorials – or crosses – were built and last in line was one in the hamlet of Charing, just outside the King’s Palace of Westminster. The original Charing Cross stood where Trafalgar Square is now. The location marks the spot from which distances to London were calculated, but the Cross itself was pulled down by order of Parliament in 1647. Four of the regicides, those who signed King Charles I’s death warrant in 1649, were hanged, drawn and quartered on the site in 1660 and, in 1675, a statue of King Charles I on horseback was erected there – where it remains to this very day. 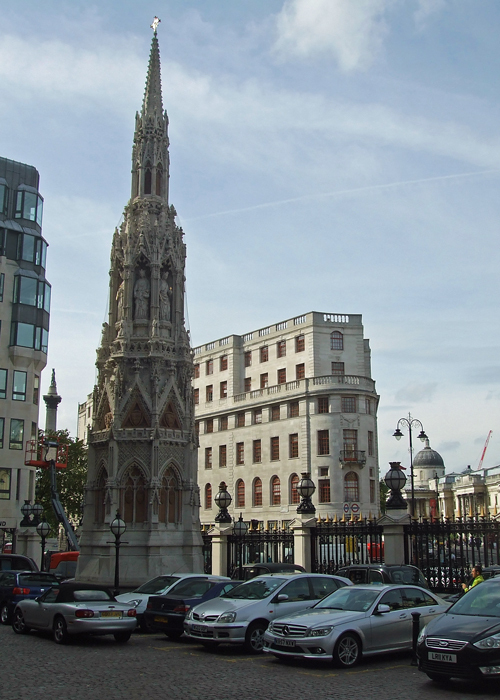 Though Eleanor’s memorial had gone, the name of the area, Charing Cross, stuck – though not derived from cher reine (dear queen) as some fancifully suggest but, as mentioned above, from the little settlement that once stood between the City of London and Westminster. (There is another Charing in Kent, by the way, near Ashford – a lovely village.) In any event, it was natural to name the nearby railway station, when it eventually arrived, Charing Cross. 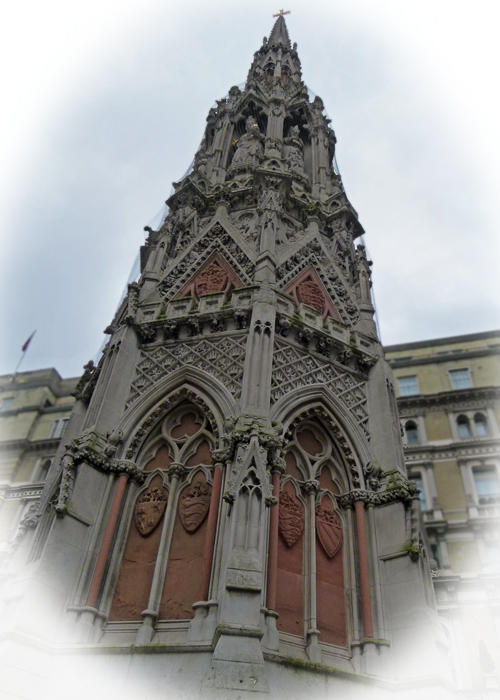 The South East Railway commissioned a recreated Eleanor Cross to celebrate the opening of the Charing Cross Hotel in 1865 and the result was a typically magnificent Victorian Gothic Thing in Portland and Mansfield stone, with Aberdeen granite, that stood 70 feet high and cost about £1,800.00. By the turn of the millennium, that monument was in a poor state of repair and Network Rail, successors to the South East Railway, set about renovating it at a reported cost of £350,000. The original cost Edward I about £700 at 13th century prices. So there it is. It is lovely. But each time I pass it, it has been surrounded by cars, bikes, contractors’ rubbish – even a skip. You have to ask why such a fuss was made about renovating the thing if it’s going to be treated with such little respect. The real villains of course, were the members of parliament, early examples of heritage hooligans, who ordered the original Charing Cross to be pulled down. There are three surviving original Eleanor Crosses, at Waltham, Hardingstone and Geddington. You can read a bit about two of them, and the love story, by visiting Eleanor’s Cross, Hardingstone and Eleanor’s Cross Geddington. I have often wondered what Eleanor of Castile looked like; I like to imagine that she must have been very beautiful. I will take the cue from you and assume that Eleanor was beautiful. Be that as it may, you’ve told a beautiful tale here – even if elements of it (Parliament, construction debris, etc.) aren’t lovely. It’s quite a story! I remember very well your previous posts about Eleanore of Castile and her story. But now I blame myself. 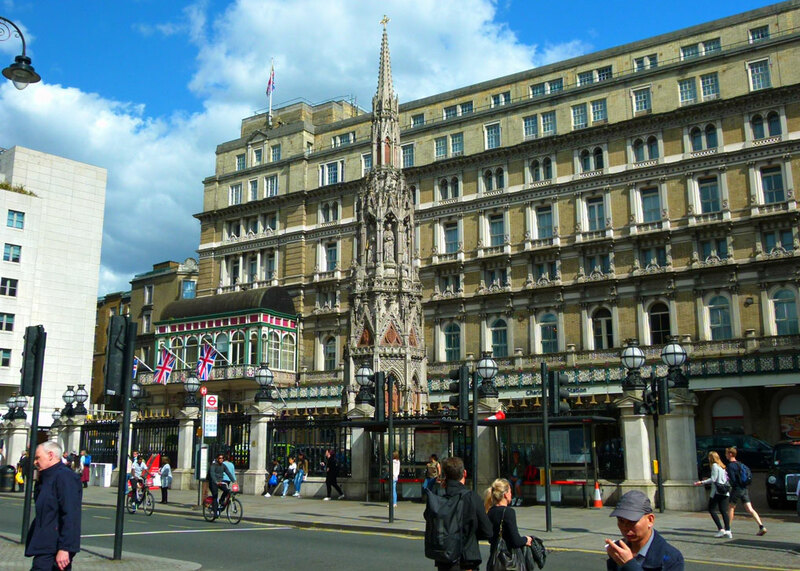 I know I have walked past Charing Cross and I had no idea what the monument stood for. It would be much more meaningful to pass it now for me! I need to go back! Oh wow you turned up in my Facebook feed this morning via a group that I follow. You’re famous! It is sad to know that the monument is not respected especially as it was renovated. That really does look an exquisitely carved monument. Lots of good information Mike, thanks. Yes, beautiful she must have been. You wonder about these famous beauties in history: Cleopatra, Helen of Troy, Mary Magdalene. And what did Eleanor of Aquitaine look like; how about Maid Marion, Queen Guinevere? The woman who inspired the Taj Mahal? Mmm – unfortunately, Maid Marion and Gunevere almost certainly did not exist. But you do wonder what these people were like! 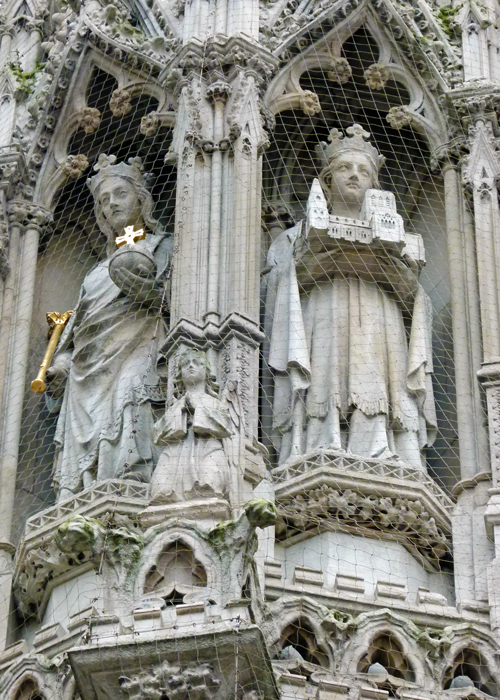 Boy I wish I could see back into time to see what those twelve crosses and the country and London looked like then. I’ve always loved that sweet gesture of the King for his beloved queen. Another informative historical piece on something we don’t notice. What a beautiful love story, Edward I must have loved her very much to have all those memorials built. Yes, Jo – I’m intrigued by Edward – on the one hand, a fearsome medieval king; on the other capable of deep love? How lovely, thank you for this piece of history. I hadn’t realised that the monument at Charing Cross was not original. I was in Geddington trying to “dig up” ancestors 5 years ago and have been in Hardingstone on the way to visit someone in Collingtree, and was at Charing Cross a couple of years ago…. only Waltham Cross to go! Eleanor must have been a very much loved wife. Hardingstone’s lovely – and interesting. Hope your ‘dig’ was successful! Both Waltham Cross and Waltham Abbey are on the list..! I so admire the talent of the Brits for keeping bits of beauty and history out there in public view. Here in the US, all the monuments, except those in DC that bring in the tourists’ cash, are eventually–and usually– torn down to make way for some ugly excretion of a building that ought not be foisted on people. Or a road widening project. I’ve never looked for Eleanor’s memorials in my travels there, but if I’m lucky, I’ll get another chance and will have the info to hand for finding these beautiful memorials. You’re right about the clutter round the Charing Cross; I don’t think I’ve ever seen the base of it properly. It has been nicely restored, though! Thanks for this post, Mike. Glad to hear they were hanged, drawn and quartered. I didn’t know it was a village name, I did think it was cher reine. Being hanged, drawn and quartered was barbaric – terrifying; how far we’ve come. As for Charles, he was an absolute monarch and had to go – though it would have been preferable if he’d gone quietly into retirement.